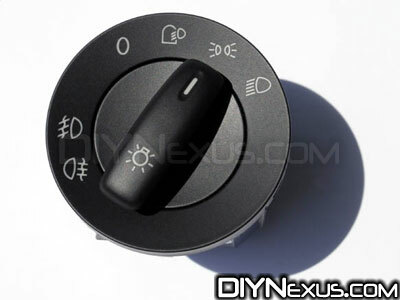 This DIY explains how to remove the original headlight switch and replace it with the European version. This will give more lighting options (headlights, fogs, parking lights, etc…) than are normally available in the US. Thanks to Cerksies from the ‘tex for the use of his shiny new MK5 GTI. The procedure below is very simple and should take around five minutes to complete. 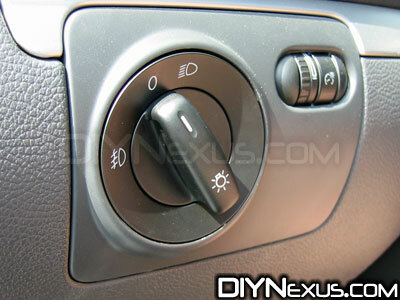 1) European headlight switch. This can be obtained from eBay or your favorite VW parts store/site. There are a couple of versions of this available but they all use the same installation procedure. 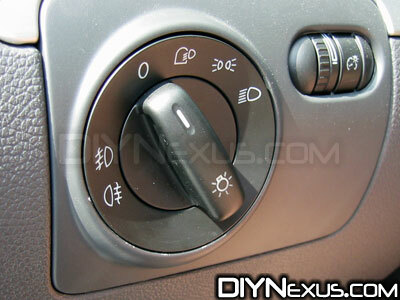 1) Locate your headlight switch to the left of the steering column. 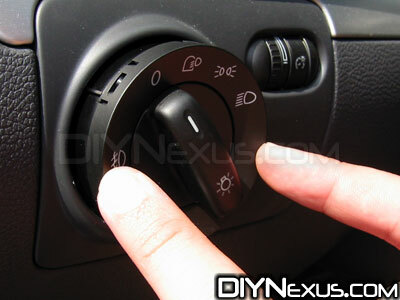 2) To remove the switch you’ll need to make sure it is pointing at the ‘O’ for off. 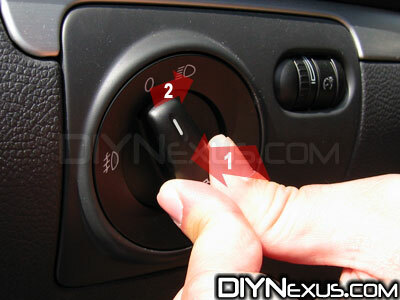 Then, (1) push the switch inward and, while still holding it in, (2) turn it to the ‘on’ position. This should release the clips, which will allow you to pull the entire assembly straight out. 3) Now that you have the switch out, you’ll need to unplug it from the wiring harness. Simply push the small tab in on the plug and wiggle it free. 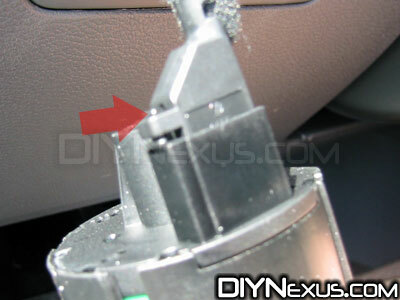 4) To install your new switch, plug it in to the wiring harness, then align it with the hole in the dash and carefully press it in, as shown in this pic. The clips will lock into place automatically. 5) You’re all done! Enjoy your new lighting features.